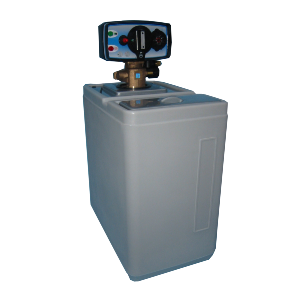 Our range of hot water fully automatic softeners are designed to operate at a maximum temperature of 65 deg.C. These are built with the highest quality components, using industry standard control valves. As with our cold water range, we offer a choice of either a durable high quality cabinet, or a separate system which allows the flexibility of having the resin and salt tanks some distance apart and which also offers the customer easier manoeuvrability for cleaning etc. Unlike other suppliers we do not charge a premium for having them separate! ALL PRICE ARE EXCLUSIVE OF VAT AND DELIVERY. Suitable for commercial front loading & pass-through dishwashers and washing machines with a hot water feed. Water capacity between regenerations is 1900 litres @ 300 p.p.m. incoming hardeness. HW10 - 640mm high, 275mm wide and 450mm deep. DDHW10 - Vessel - 200mm dia,,640mm high, Tank - 340mm dia, 620mm high. Suitable for front loading & pass-through dishwashers. DDHW30 Vessel - 260mm dia, 1100mm high, Tank - 420mm dia, 760mm high.